Apologies if this has been covered elsewhere, a quick search didn't answer my question. I've just started building pedals using vero board. How do you professionally mount the vero board to the enclosure? At the moment I am using two cut sponges, one in the enclosure and one in the lid, to lightly hold the board in place. I put some paper on the under side of the vero to ensure no shorting issues. But this is a very crude method, I am sure there is a better solution or off the shelf product. I have something in mind like some pins that go through the 4 corner holes of the vero, then you solder these to the chassis, but can't find anything. Obviously here you'd need to make sure you're not accidentally grounding everything, but this would be easy to manage. Anyway, if you use vero, what do you do?! I put a little piece of foam underneath it and use solid core wire for the off-board components. By the time you have everything wired up, the wire provides a little structure that hold everything into place. Thanks guys - any pictures so I have a visual!! i think pcb standoffs are probably the best way to go, and i try to use them as much as i can. although, i have used both 3M tape and velcro before. it sounds like standoffs are what you are looking for, but you might have to drill more holes into the box as they sometimes mount with screws. sometimes you can get ones that are made of nylon, and they have a flat sticky backing that you just use like a sticker. also, with the metal ones, you can connect your ground point on the board to them and have it connect to the chassis this way. IMO he's the #1 "veroboardist" on the forum and use a very clever sistem to fit things in place! Hey, kdmay... still interested? Here is! When I'm cutting the vero, I leave 3 columns of holes on either side of the circuit and slowly drill a small hole through one of the holes in the middle column (of the spare 3) on each side. If I can't afford the extra room this takes up, I might try find a conveniently placed trace cut to put a hole through. The mini standoffs require a 3.2 mm hole, but my 3mm drill bit does the job. I'll sometimes glue a bit of foam between the legs of each one too for good measure. Probably overkill, but at least it might protect the copper from ageing too fast. I've heard torchy mention he gives the copper side of his vero's a light spray of clear coat too which sounds like a good idea, though I haven't tried it. The spongey bases of the standoffs probably offers some protection against shock/vibration too. 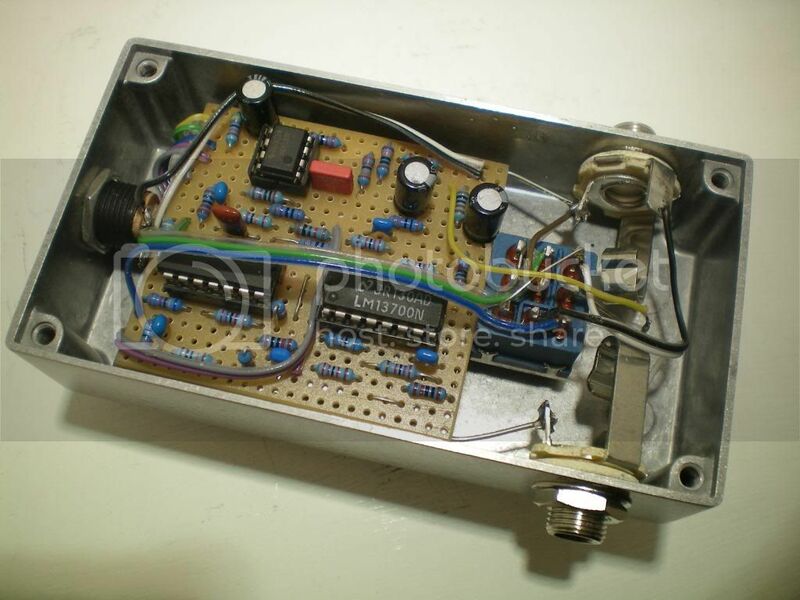 ME: Say I bought this model of standoff http://www.banzaimusic.com/Brass-Standoff-XT-08.html I understand that I drill a hole in the enclosure, the flat side sits flush with the enclosure and I put a machine screw (are they called that in English?) though it from the outside of the enclosure. Then I have the thinner, threaded side going through the hole in the pcb. Do I then just find a small washer and nut and screw that on? Should I use a nylon washer? edit: and what do you do with those standoffs that don't have the thinner, threaded bit sticking out? RnFR: yes. with the other ones you just use a screw on either side. you can also use unthreaded spacers and a long bolt and nut. nylon works. or lock washers and some loctite or nail polish. if its all metal you can use it as a ground point. So if anyone else is looking at standoffs going "wow, they look awesome, maybe if I just throw them in there with the pcb everything will stick" you now know the truth of the matter.